As the saying goes, time is money. A movie show is a transaction between the consumer and the movie house. A movie is of fixed duration shown at a fixed location. This means that the same movie can only be shown at fixed times during the day. These show times are publicized carefully (e.g. 2pm, 4pm, 6pm, 8pm, 10pm) so that consumers can arrange their schedules. Suppose that a show is publicized to begin at 8pm. When exactly should the consumer arrive? Ordinarily, it would be prudent to arrive a little bit earlier to purchase the tickets. Once done, the consumer may wish to eat, drink or shop in the neighborhood until showtime. Now the story is not as simple as this. While the show is publicized to begin at 8pm, it does not mean that the movie will begin at exactly 8pm. First of all, the cinema may show paid commercial advertisements. Second, the cinema may show trailers of coming attractions, which are another form of commercial advertisements. The reception to these two forms of commercial advertisements may not be identical, since the first is the intrusive form of commercial advertisements as seen on television or heard on radio while the second is appealing to cinema aficionados. We will now refer to some survey data from the 2004 TGI Argentina study. This is a survey of 5,154 respondents between the ages of 12 to 75 years old in Argentina conducted during the first half of 2004. Within this survey, 35% of the survey respondents said that they had attended the cinema in the past 6 months. Within these movie-goers, 76% of them said that they arrive early at the cinema before the movie itself begins. Among the early arrivers, 85% said that they were there to watch the commercial advertisements and 91% said that they were there to watch the movie trailers. 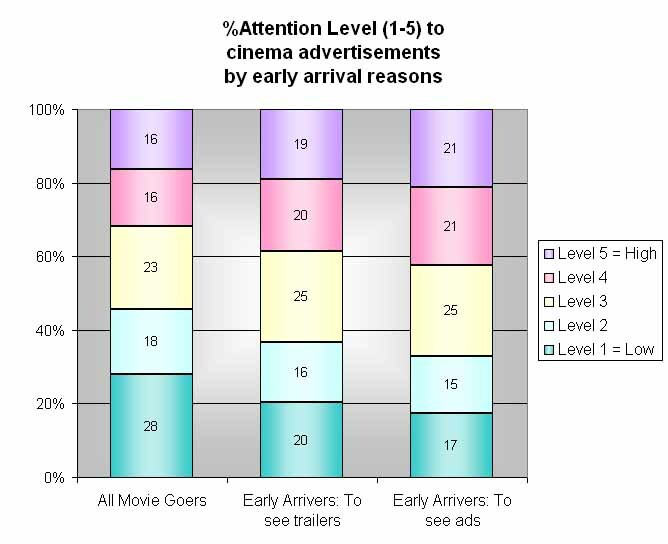 The chart below shows the attention level by all movie goers and the two types of early arrivers. This is self-validating as expected -- those who say that they arrive early to see the ads are more likely to pay attention to those ads; conversely, those who arrive late pay less attention to the ads.